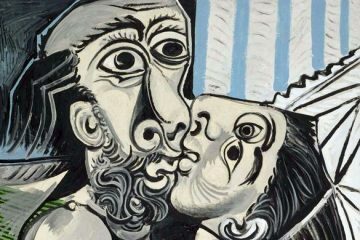 Graffiti, murals, vandalism—street art takes on various names, but one thing that rings true across the world is the cultural relevance behind these works of art. 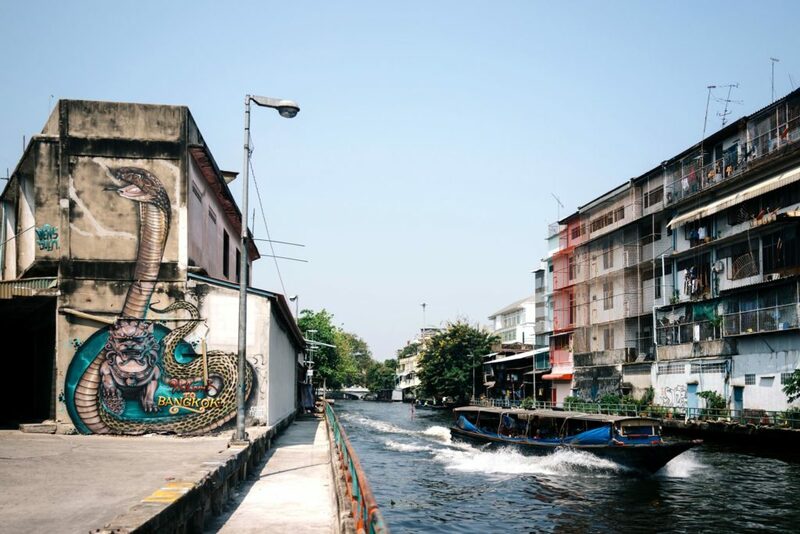 A building with graffiti depicting a snake sits along Khlong Saen Saep, a canal in central Thailand. Street art is a city’s outdoor museum. 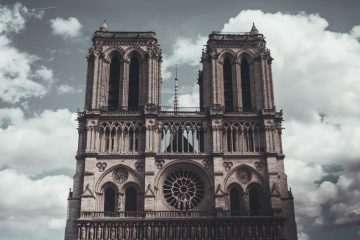 Not just attractive to look at, it often functions as a gateway into the underlying social, cultural, or political concerns of the setting in which it appears. 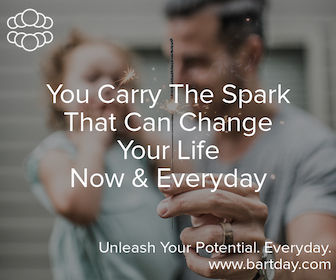 While it is easy, upon coming across a beautiful work of art on a city’s wall, to simply snap a photo, upload it to Instagram and move on, the best street art merits spending a few moments to think about what it wants to say. Here we take you on a tour of seven of the world’s best cities for seeking street art with a conscience. 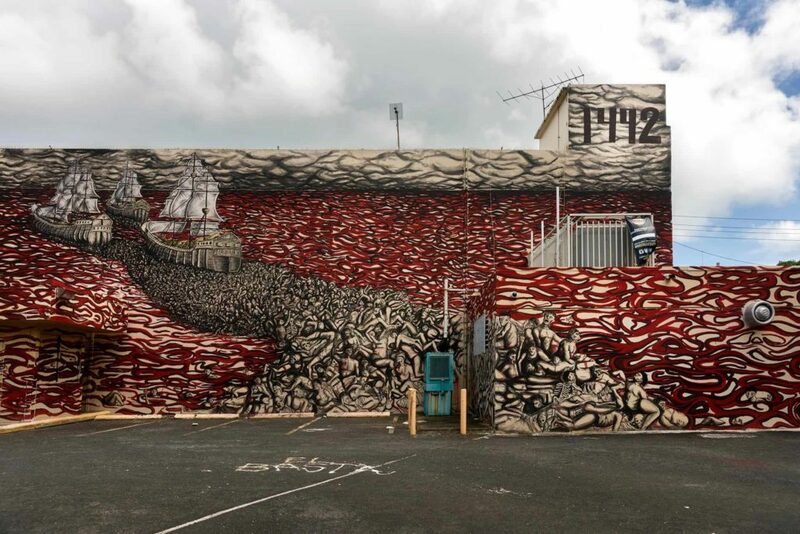 This wall of graffiti in Puerto Rico shows Christopher Columbus’s arrival on a sea of blood and death. Launched in 2010, the Santurce Es Ley street art festival lit a spark in San Juan’s long-neglected Santurce neighborhood, helping to transform it into a major art destination. But the murals that cover buildings here are not mere wallpaper: many take aim at Puerto Rico’s contemporary and historical issues. This mural in Bogotá, Colombia is by Toxicómano in collaboration with DJ Lu, Lesivo, and Guache. The continuing reverberations of Colombia’s history inform Bogotá’s politically minded street art—and a recent event influences how it is produced. Following protests over the police’s fatal shooting of a teenage artist in 2011, Bogotá largely decriminalized street art, allowing elaborate murals to flourish. Starting on Carrera 4 and Calle 12, where a vibrant indigenous-themed mural by Guache covers Holofónica music studio’s façade, explore the rambling, art-filled streets of La Candelaria before heading toward El Centro. 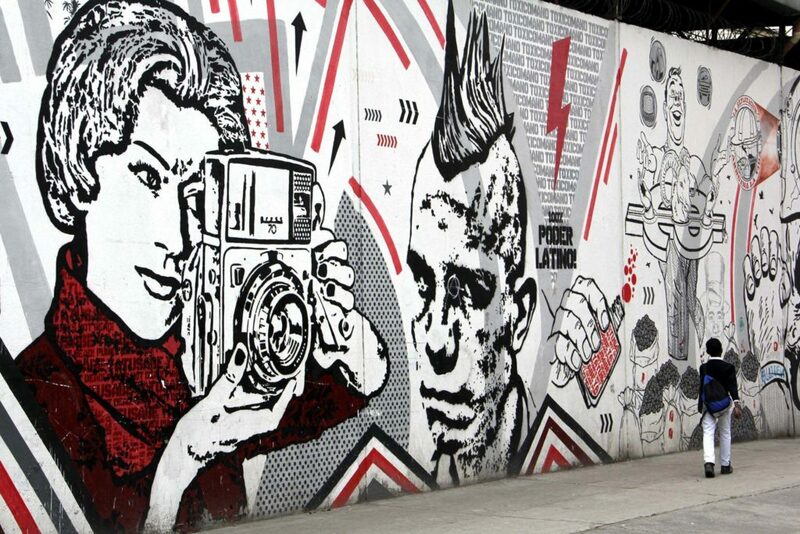 Where Carrera 4 intersects with Calle 20, find several themes distilled into one large mural. By the stencil collective Toxicómano, in collaboration with DJ Lu, Lesivo, and Guache, it features the faces of homeless people, suggesting a nod to ‘false positives’ scandal which saw the army lure poor civilians to remote areas with promises of jobs before murdering them, dressing them in rebel uniforms, and presenting them as guerillas. The grenades that litter Colombia’s countryside—remnants of the country’s decades-long armed conflict—also appear, alongside sacks of money and a miner’s helmet, referencing capitalist greed and exploitation of Colombia’s natural resources. The exiled Iranian duo, Icy and Sot, depict monochromatic children showered in a rainbow of colors. A neighborhood often depicted as the epicenter of cool, Williamsburg inevitably attracts tourists utilizing the art of its streets as selfie backdrops. Look deeper and discover works depicting the diverse faces of humanity that make up the fabric of our cities. Start on North 10th and Bedford where a portrait of an Italian-Jamaican boy named Camilo forms part of Jorit Agoch’s ‘human tribe’ project. Three blocks south on Berry, Lay Your Weapons Down by Faith47“reflects on the profound nature of connectedness between people.” At TBA Brooklyn on Wythe, the exiled Iranian duo Icy and Sot depict monochromatic children showered in a rainbow of colors. 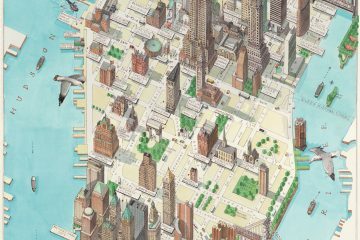 The duo’s work often comments on the restrictions of life in their home country and this piece could be read as a representation of the creative freedom they have found in Brooklyn. A depiction of a panda with a spray can by artist Leo Lunatic adorns the outside of an old apartment building in the Galata District in Istanbul, Turkey. 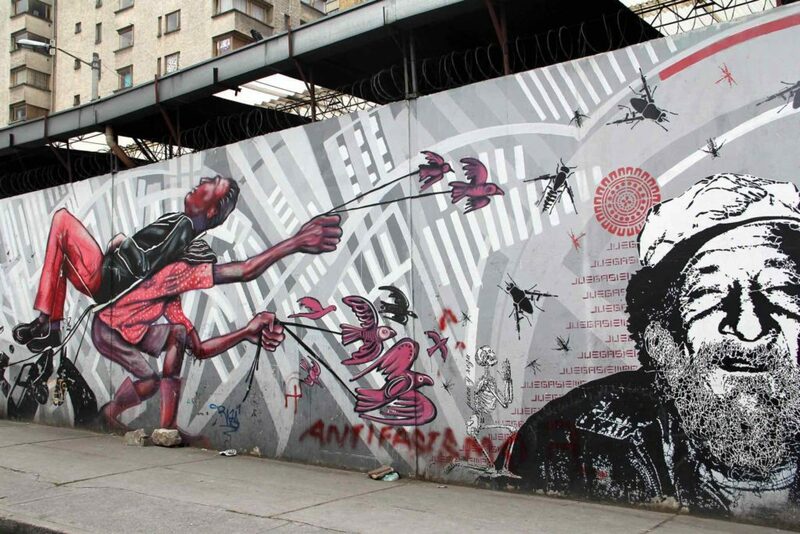 Culturally, Istanbul’s street artists draw heavily from local history. Many “depict Roman or Grecian busts in our artwork, reflecting Istanbul’s past and sculptural heritage still found across modern-day Turkey.” Leo himself often incorporates motifs inspired by Ottoman tiles and architectural details, although his signature is a panda, many versions of which float across the city’s walls. 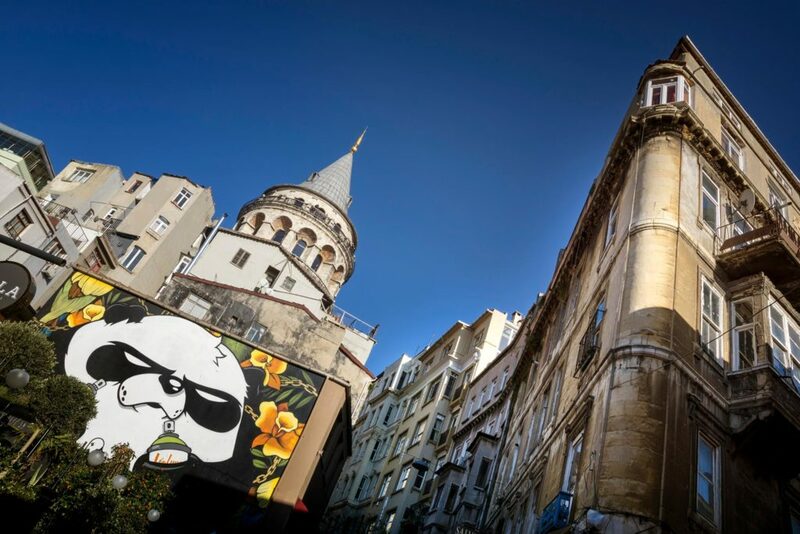 A two-story-high panda clutching a spray paint can in each paw looms beneath the Galata Tower in the Karaköy district. 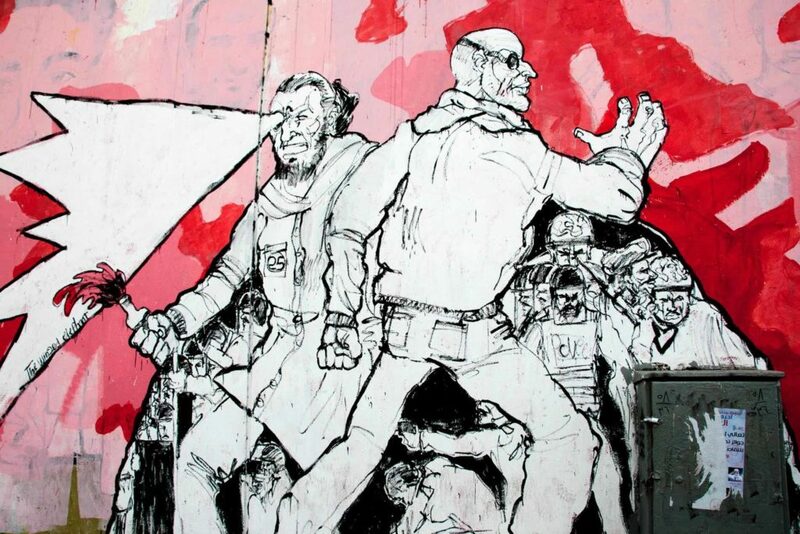 From there, continue southeast through the café-filled backstreets, toward the Bosphorus, to find art covering walls and shop shutters, much of it by the artists Mr. Hure, Olihe, and Luckypunch, whose story was recently told in the documentary Revolt Against Gray. 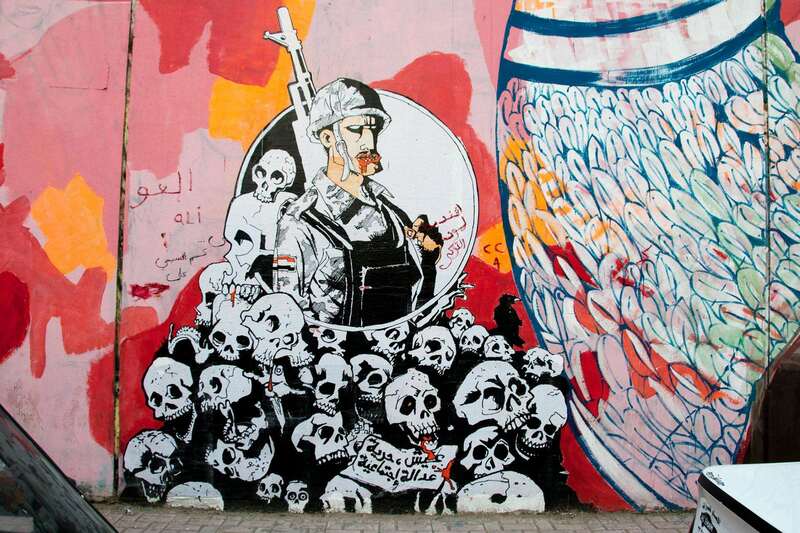 The graffiti on Mohammed Mahmoud street is a standing reminder of the violence of the 2011 revolution. Bangkok offers visitors the opportunity to see street art from an unusual angle: from the water. Murals created during last year’s Bukruk Urban Arts Festival come into view when traveling on the Chao Phraya Expresspublic ferry from Tha Thien Pier to King Taksin Bridge. 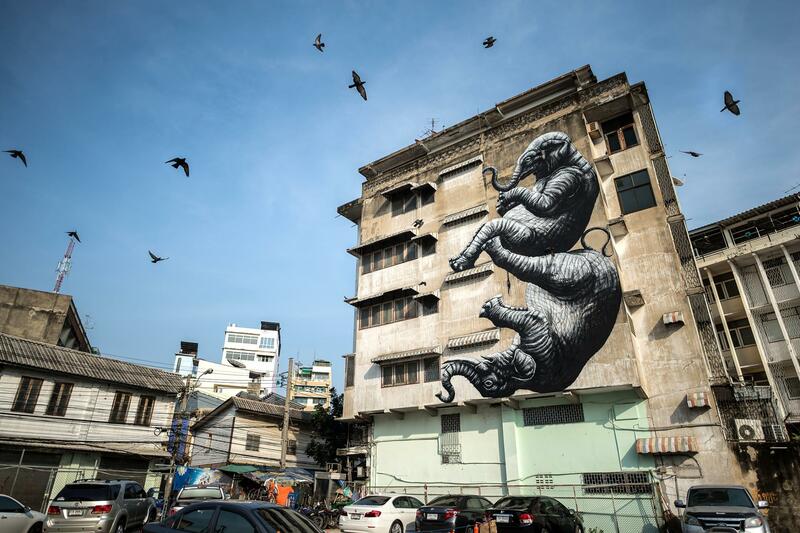 A mural by Roa shows two elephants tumbling down a building wall in Bangkok, Thailand. 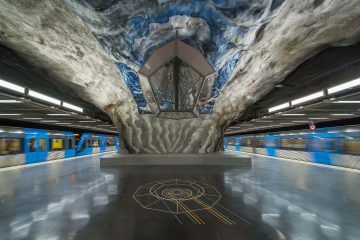 The city’s landscape and its residents provided artistic inspiration. Cruising by Chinatown, you’ll spot a cluster of bicycles painted by Aryz, who said he used saturated colors to blend in with the environment. Two elephants tumble across the wall opposite, painted by Roa, who always depicts creatures living in the surroundings he paints. Every year residents volunteer the walls of their homes and businesses to artists participating in Stavanger’s NuArt street art festival. No one knows what the artists will produce, but all agree to leave the artwork in place for at least a year. Often, the result is a conversation about local issues played out in public space. Artist Roa depicts a bisected whale spurting blood and oil on a building wall in Stavanger, Norway. 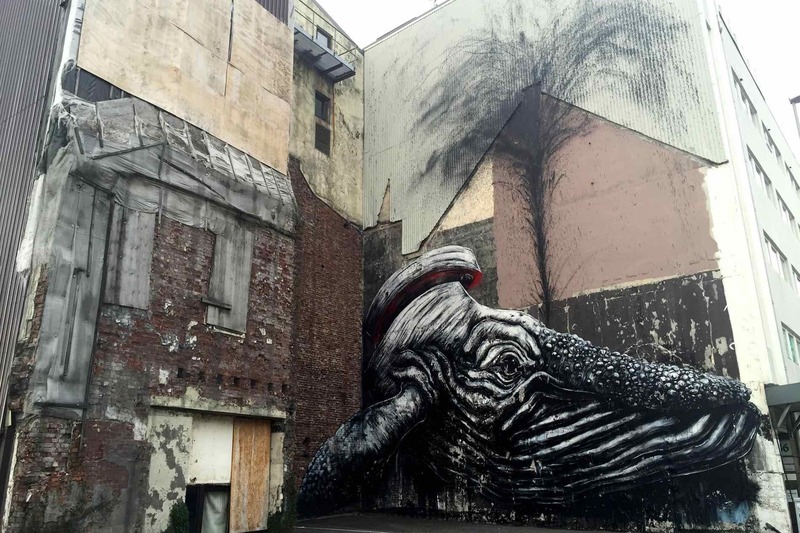 Start in the city center where, behind the Scandic Stavanger City hotel, a black, white, and red painting by Roa depicts a bisected whale spurting blood and oil—one of several that take Norway’s whale hunting tradition, and/or oil dependence, as its theme. Continue east to Storhaug and two 160-foot-high silos come into view. By Fintan Magee, Monument to a Disappearing Monument addresses the slump in global oil prices and its effect on the economy of Stavanger, Norway’s oil capital. The piece depicts an oil worker painted on one silo and his image reflected, breaking into pieces and vanishing, on the other.